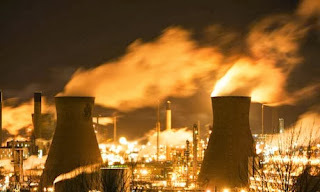 ianwatt.blogspot.co.uk: Grangemouth - when are we going to put the Eco into Economy? Grangemouth - when are we going to put the Eco into Economy? I'm familiar with the Grangemouth refinery having lived in Fife for many years and as my daughter Amanda and her family live just a couple of miles from the place. At night, its flare stacks light it up like a vision from Heironymous Bosch. I used to drive around Fife delivering furniture from my shop, travelling through the strings of grim-looking villages left in an economic bog after the collapse of the local coal industry, a striking contrast to the posher parts of Fife like St Andrews, where people could afford to spend more on furniture. So I've got mixed feelings about Grangemouth, the immediate local effect of the place closing would be devastating for so many people, but if ever there was a symbol of the Earth-devouring craziness of our oil-powered times here it surely is. There's only so much oil in the ground, it's bound to close one day, so, even leaving aside the dire warnings from the IPCC and others, isn't it time to start thinking seriously about making the transition to a truly sustainable way of life?